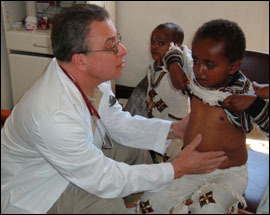 Dr. Menkin traveled to Ethiopia to work with Ethiopian refugees at one site and then onto an orphanage to care for HIV infected children. The sponsoring organization, AHope for Children, provides well staffed homes for infected children orphaned by HIV disease. 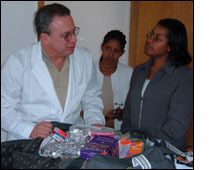 Dr. Menkin and his team brought 150 pounds of drugs and equipment for the orphanages, and spent time setting up treatment and emergency protocols. He also worked directly with the children, who are doing much better than he had expected thanks to ARV programs that will allow them survive into adulthood and become functional members of their communities.